This combo of spice-infused, tart US apples and Kentucky bourbon makes delectable pie in record time. There's no apple pie as American as a bourbon apple pie, and this one is a Yankee Doodle dandy. 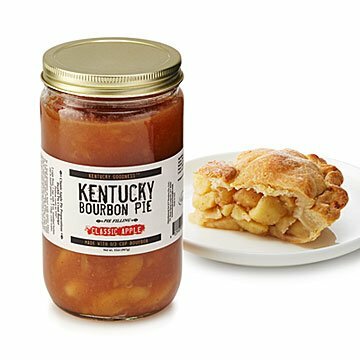 Made with spice-infused, tart, US-grown apple slices and authentic, aged Kentucky bourbon, it can be poured into a pie shell while the oven warms up. Bake it for just under an hour and have hot, irresistible apple pie in record time. (It'll disappear in record time, too.) The bourbon adds dimension to a sweet, all-American classic. Or, go in a different dessert direction and make a quick apple crisp, spoon it over ice cream, top a stack of pancakes, or drizzle it onto goat cheese. And give a thought to Johnny Appleseed as you ascend to apple heaven. Made in Kentucky. Pair the Bourbon Apple Pie Filling with our Stoneware Apple Baking Dish for the perfect at-home apple crisp. We made the apple crisp recipe on the label and it was perfect. Everyone loved it.